Mo Willems is one of my most favorite children's authors. He is a three time Caldecott Honor winner and has won two Geisel awards for his early reader books. The critics who truly matter, my two boys, have also given Mr. Willems two thumbs up. They love his Elephant and Piggie books, Pigeon books, and Knuffle Bunny trilogy. This month, the Virtual Book club for Kids has selected Mo Willems' books. The Virtual Book Club for Kids is a group of bloggers (including me) that feature specific books each month and provide book activities to accompany these books. These activities are great for families, homeschoolers, preschool and kindergarten teachers. I have chosen to focus on Mo Willem's Knuffle Bunny: A Cautionary Tale. Keep reading the post to find book activities on other Mo Willem's featured books of the month. Does your child have a security blanket or toy? In this book, a toddler named Trixie has a beloved Knuffle Bunny. One day the bunny gets left at the laundromat. Trixie tries to inform her dad of the missing bunny but poor dad doesn't speak toddler. An upset Trixie arrives home. Mom notices the problem. A return trip to the laundromat results in a retrieved rabbit and a talking toddler. Trixie pronounces her first words, "Knuffle Bunny!" This is a hilarious narrative story that parents and children will love! Children will also love the follow up books in the series Knuffle Bunny Too: A Case of Mistaken Identity and Knuffle Bunny Free: An Unexpected Diversion. Knuffle Bunny is a great first narrative text for children. It shows children a strong beginning, middle, and end of a small moment of life. It is very beneficial for children to be exposed to many of these stories before entering school. Listening to stories embeds the story structure into a child's oral language and eventually helps the child to easily retell and write stories. One of the best parts of the Knuffle Bunny series is that a child could pick up the book and easily retell the story by using the engaging illustrations. The illustrations are a mix of sepia toned photographs with cartoon characters drawn over the top. 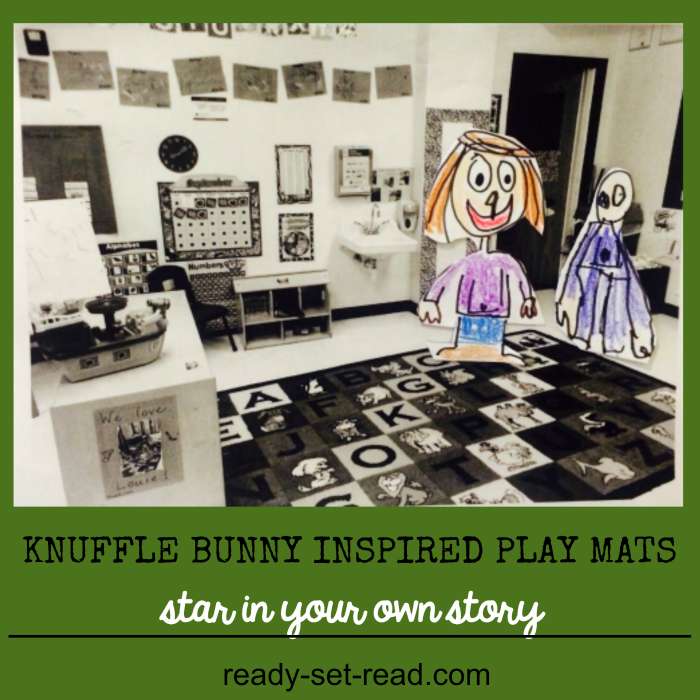 I created some Knuffle Bunny inspired activity mats to encourage my boys to expand their own story ideas through talking about a story. 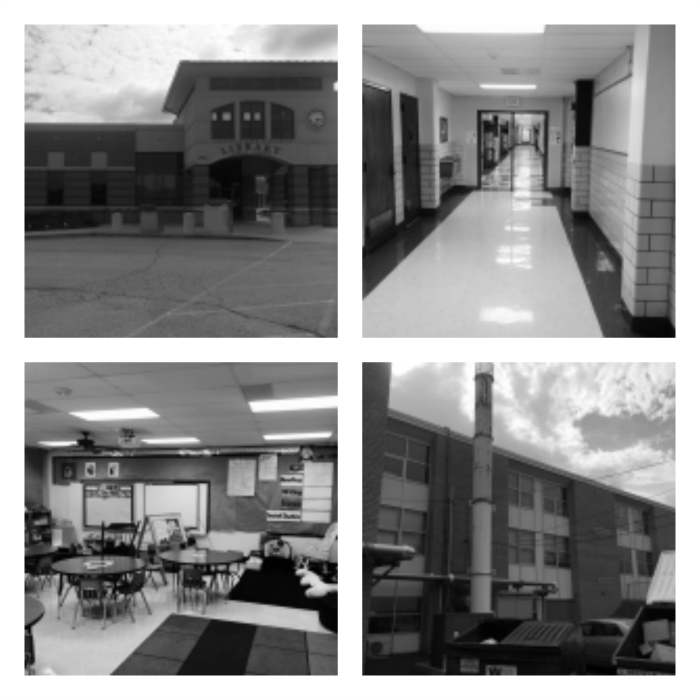 I began by taking pictures of various locations-- their classrooms, school, library, hallways, etc. I even found some cool pictures of buildings. I printed these photos in black and white. 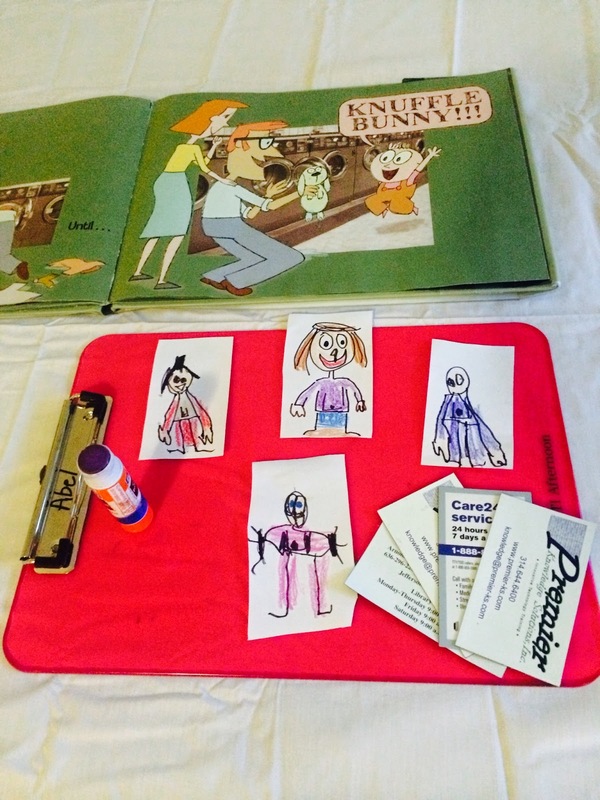 Then the boys created drawings of themselves and family members or friends and colored them. 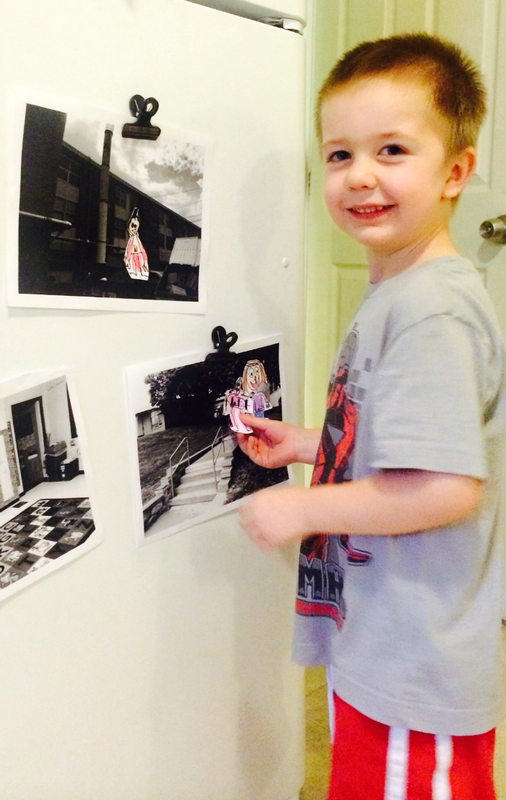 We glued their drawings onto magnets. We get a lot of free magnets in the mail with business information printed on them. They were the perfect size for holding our artwork. I cut around the illustrations so they became magnets. I posted the Knuffle Bunny activity mats on the fridge or an easel where the boys had easy access. I put the magnets nearby and let them tell their stories with the magnets. I often posted more than one picture at a time to allow the boys to build their stories. So far, I have visited Tyson at school a lot and Tyson has zip lined on the power lines outside school A LOT! I love the mind of a four year old. Helping your young child to develop strong oral language skills around stories will help your child to be a successful reader and writer in the future. The Virtual Book Club for Kids is featuring the following Mo Willems Books. We look forward to doing all of these activities this month! I'd love if you'd join the VBC next month as we explore these books by Julia Donaldson. You might want to order your copies now or put them on hold at the library! I will share those book activities on October 9th. Great idea to create art inspired by the illustration style. I definitely want us to try this! What a fun idea to take your own environment and incorperate it into the book concept, luv it! I'm so glad you're joining us as a co-host for the Virtual Book club for Kids this year. Can't wait to see what else you share. Oh my goodness I love this so much! Great idea!